Democratic Unionist Ian Paisley has been urged by a fellow MP to reimburse a charity for the price of a first class plane ticket to New York. The North Antrim representative travelled to New York in February 2018 to participate at a seminar about Northern Ireland’s peace process on the 20th anniversary of the Good Friday Agreement. 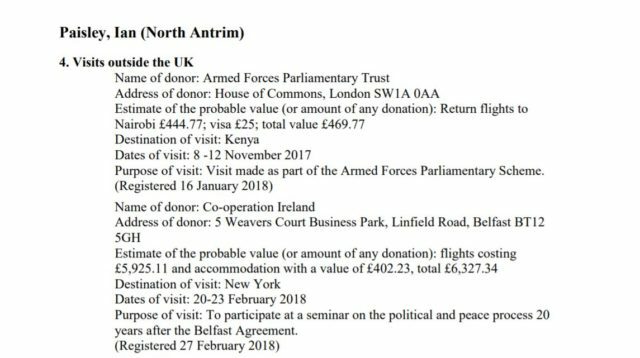 According to the House of Commons register of interests, he received £6,327.34 (€7,162) to cover a £5,925.11 flight and £402.23 for accommodation from the peace building charity Cooperation Ireland. Sinn Fein MP Michelle Gildernew has called on Mr Paisley to reimburse the costs to the charity. She claimed she has been contacted by people who have participated in Cooperation Ireland fundraising events, and said they are “absolutely disgusted and sickened that this expense was covered”. Cooperation Ireland said it did not wish to comment on the matter. The figures came to light in a story in Friday’s Irish News. The newspaper also reported that others who attended the New York event, including Táiniste Simon Coveney flew economy on the budget airline Norwegian Air. His expenses were covered by the Government. The SDLP said another attendee, former Foyle MP Mark Durkan, also flew economy to New York. This cost was covered by Cooperation Ireland. Mr Paisley refused to make any comment on the matter when approached by media as he attended an event at Ballymena Town Hall. 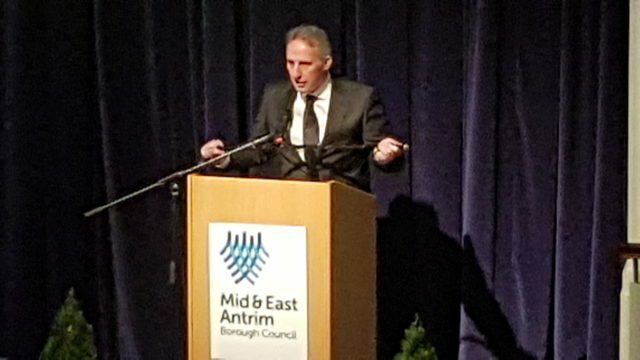 He was the guest speaker at a meal on Friday afternoon following a ceremony by Mid and East Antrim Council to confer the Freedom of the Borough on local businessman Sir William Wright. The DUP also declined to comment. Mr Paisley hit the headlines in December when a BBC Northern Ireland Spotlight programme raised a query over who had paid for a trip his family took to the Maldives in 2016 and whether he should have declared it to the House of Commons. He had argued against sanctions being taken against the Maldives over human rights abuses. The MP denied the country’s government organised or paid for the family vacation, and said he was satisfied it did not have to be recorded on the House of Commons’ Register Of Interests. He said he had covered some of the cost, and a friend had covered the rest. Last year Mr Paisley was suspended from the House of Commons for 30 days for “serious misconduct” for failing to declare two family holidays to Sri Lanka in 2013. The ensuing row led to the first recall petition in UK parliamentary history being launched in an attempt to unseat Mr Paisley and trigger a by election in his North Antrim constituency. The petition fell short by 444 votes. Mr Paisley said its failure was evidence that “people accepted” his apology.